DeepForge supports the creation of custom neural network layers using Torch7 and the easy usage of these layers in the visual architecture editor. Before creating custom layers, it is recommended to read about creating custom layers in Torch7. A new custom layer can be created from the “add layer dialog” in the architecture editor. When creating a layer, DeepForge provides a code editor for creating custom neural network layers prepopulated with a basic template for defining the custom layer. 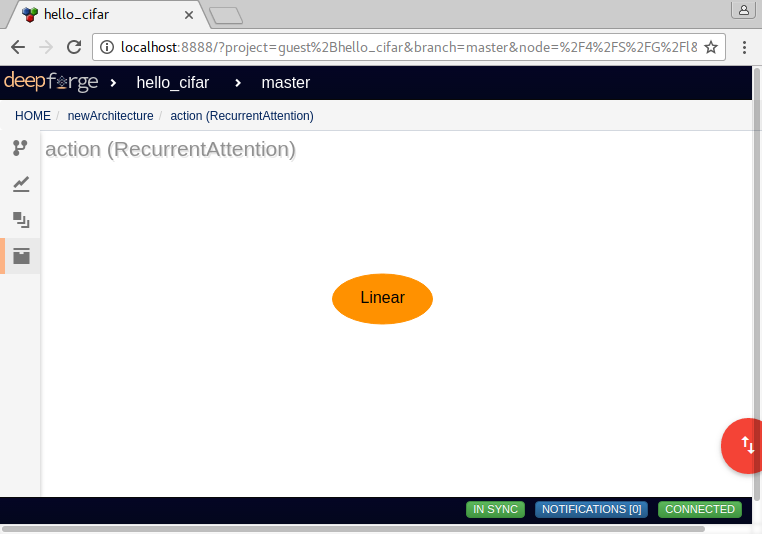 After defining the layer in the layer editor, DeepForge will provide this layer in the architecture editor and expose any configurable attributes for the layer. These attributes are parsed from the layer definition. Type assertions should be used when defining layer attributes (ie, constructor arguments or arguments to a setter function). For example, consider the following layer definition for RecurrentAttention which accepts an action layer argument to its constructor. In this example, assert(torch.isTypeOf(action, 'nn.Module')) enforces that the action variable is another neural network layer. After defining the layer, DeepForge will parse the layer definition and create a visual representation for use in the architecture editor. As this assertion enforces that action is a neural network layer, DeepForge will update itself accordingly; in this case, editing the attribute will allow the user to hierarchically create nested neural network architectures to be passed as the action argument to the constructor. 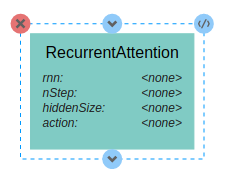 An example of the generated visual model for the RecurrentAttention is provided above. This layer has attributes for each of the constructor arguments defined in its definition. Clicking on the <none> value for the action attribute will then allow the user to provide layer inputs as shown below. where net is a container like a Sequential layer. DeepForge enforces this convention and, if it finds a setter function (which also returns self) in the layer definition will expose the internal variable (in this case ceil_mode) to the user in the visual editor. © Copyright 2017, Brian Broll. Revision e41b733d.